Rainbow colours and magical sparkles are two of the many reasons why unicorns have become such a popular international fashion trend now. A lot of people are going out of their ways to make this trend a part of their daily lives, so why should weddings be left behind! 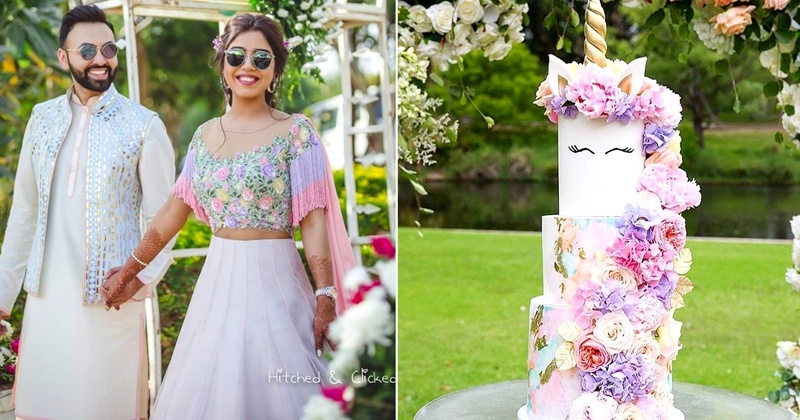 This bride wore a unicorn colour combination inspired lehenga and we can’t get enough of it already. She wore a pastel pink and white embroidered Manish Malhotra creation and we are in love with details of it. Just look at the floral embroidered bodice, those fringed sleeves, the minimal lehenga skirt and the ruffles at the bottom. So cool isn't it? Also, kudos to the groom for wearing an outfit from Abu Jani and Sandeep Khosla which perfectly coordinated with his bride’s lehenga. We are also totally taken with how in-sync is the backdrop with their outfits. Talk about balancing it right! Unicorn manicures are a subtle way to play homage to the popular trend. Holographic nails adorned with jewels, or something more subtle like a simple unicorn illustration, offer a stunning nod to the magical trend. Fashion lovers seem to have taken inspiration from My Little Pony by opting for pastel tones for their hair. The multi-toned effect is now known as "unicorn hair". However, we would suggest all the brides-to-be to opt for hair-extensions if they are not too sure about dying their hair before their D-day. You can also opt for temporary unicorn pastel shades to give your tresses a spectacular transformation. The choice is all yours! Unicorn eye-makeup is another trend that's swept Instagram this year. Reserved for those brides who aren't afraid to make a fashion statement, these unicorn eyes are a bold choice as an alternative to the regular bridal eye-makeup! Inject some fun into your wedding stationery with the unicorn invites! Or, you can also have an elegant unicorn table set in style for your reception. How cool is that? From colourful cupcakes, sugar-coated cookies to multi-coloured macarons, there are various options to harness the beauty of the unicorn trend at your dessert counter. Believe us when we tell you, your guests are going to love it! Think pretty pastels in pops of pink, green and purple to create a truly mesmerising floral arrangement for your wedding. How about a unicorn colour-palette inspired phoolon-ki-chadar? In the spirit of the theme, how about unicorn inspired wedding favours for your guests? Rest assured your wedding guests will really be stunned and amazed by these favours! That’s all folks! How about incorporating some of these points into your wedding?